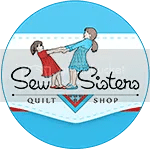 It has been ages since I’ve worked on these blocks but lately I’ve been thinking about just how much I know I’ll love this quilt when it’s done. So out came that project box and some new blocks were made. 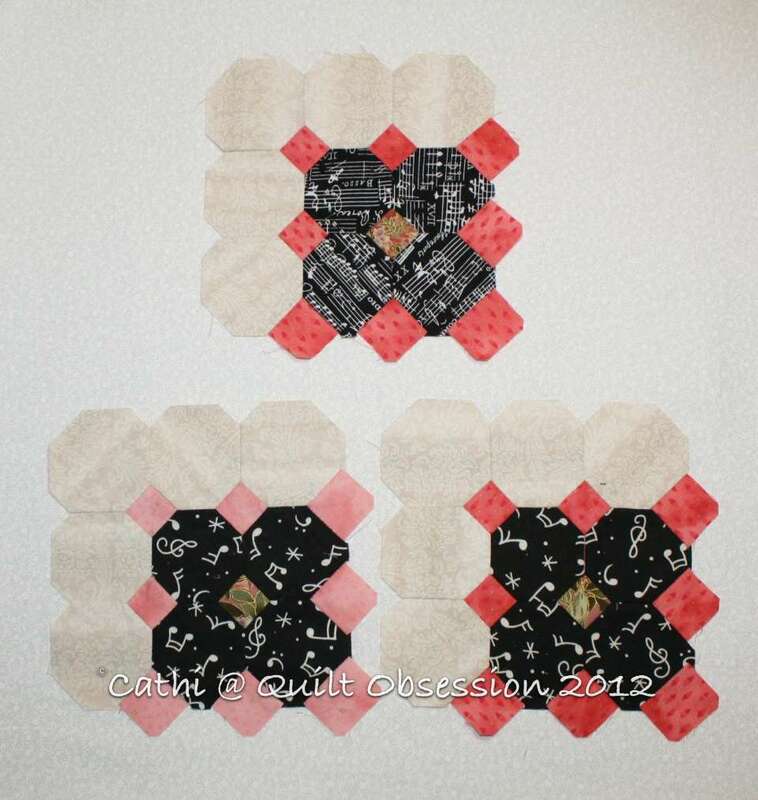 First up, a few blocks made with pink squares. 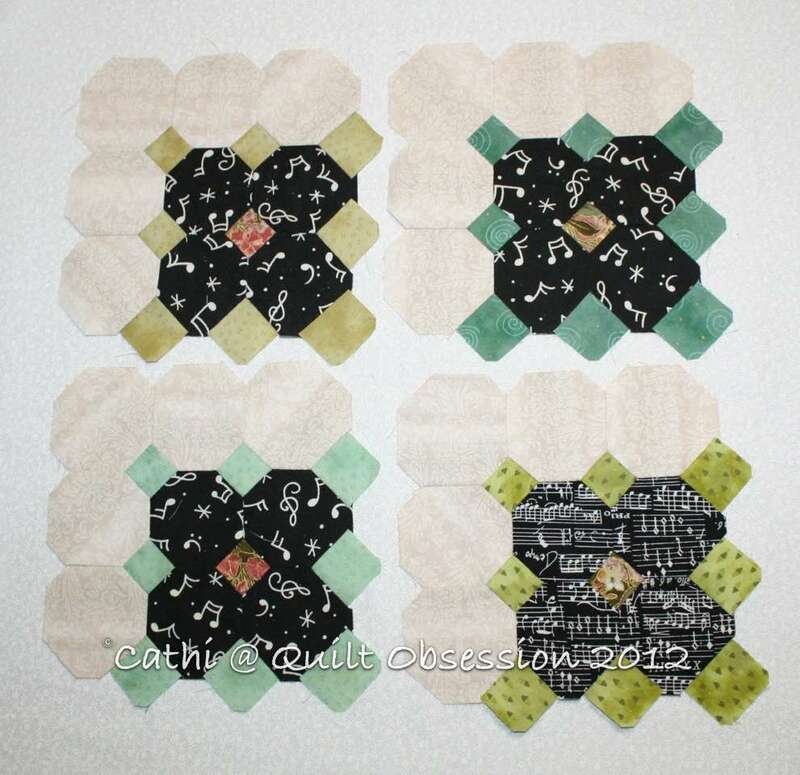 Then a few with green squares. A couple of purples, an orange and another blue. 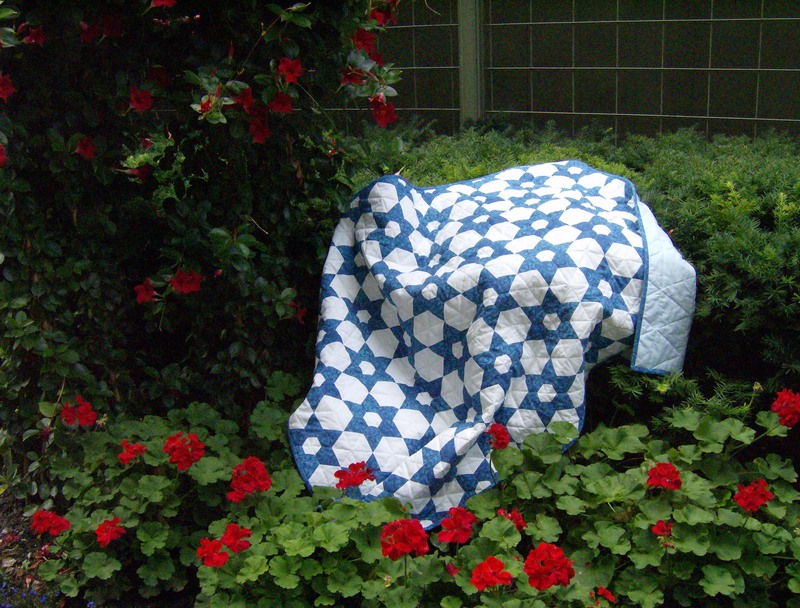 There are still many, may blocks to be made. I’ve decided against joining them together as I go as I’d like to make sure I balance the colours in the layout as much as possible. At least by adding the outer octagon along two edges of each block, the joining should be rather quick once the layout is decided upon. For those who haven’t followed my blog for long, the Harpsichord Quilt is inspired by both the original Lucy Boston Keyboard Patchwork and the amazing harpsichords we saw in the summer of 2008 which had the most incredible decorative artwork. Baxter still brings his favourite toy to bed at night and sometimes leaves it there during the day. Yesterday we found out why. He likes to have it handy when he decides to stretch out for an afternoon snooze on the bed. Musical instruments are beautiful. A music festival we attend each year has a dedicated section for makers to show their wares, and I always spend ages in there. 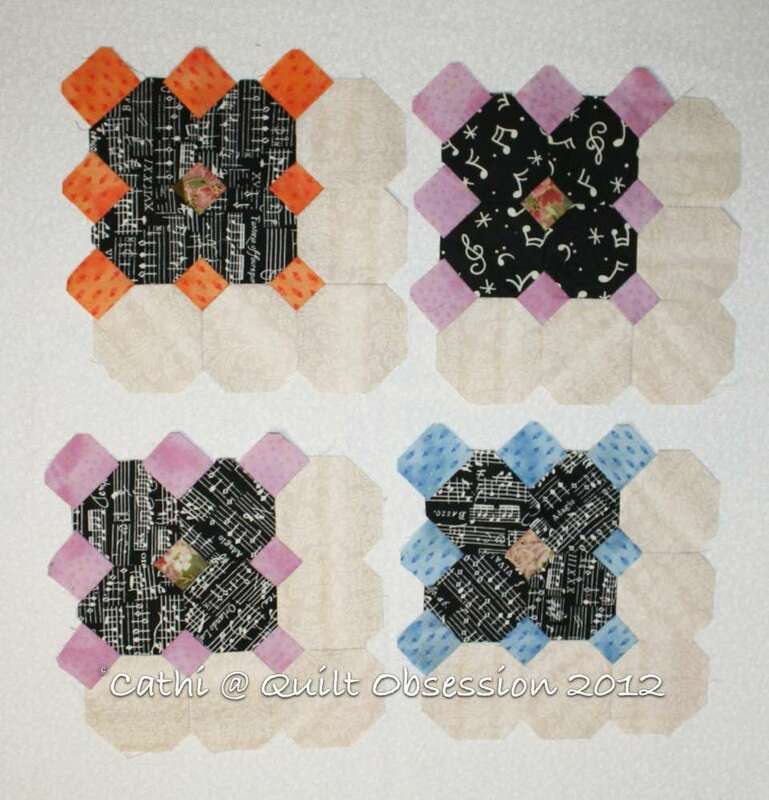 Your harpsichord blocks will make a lovely quilt! My heavens, Baxter is one big boy. 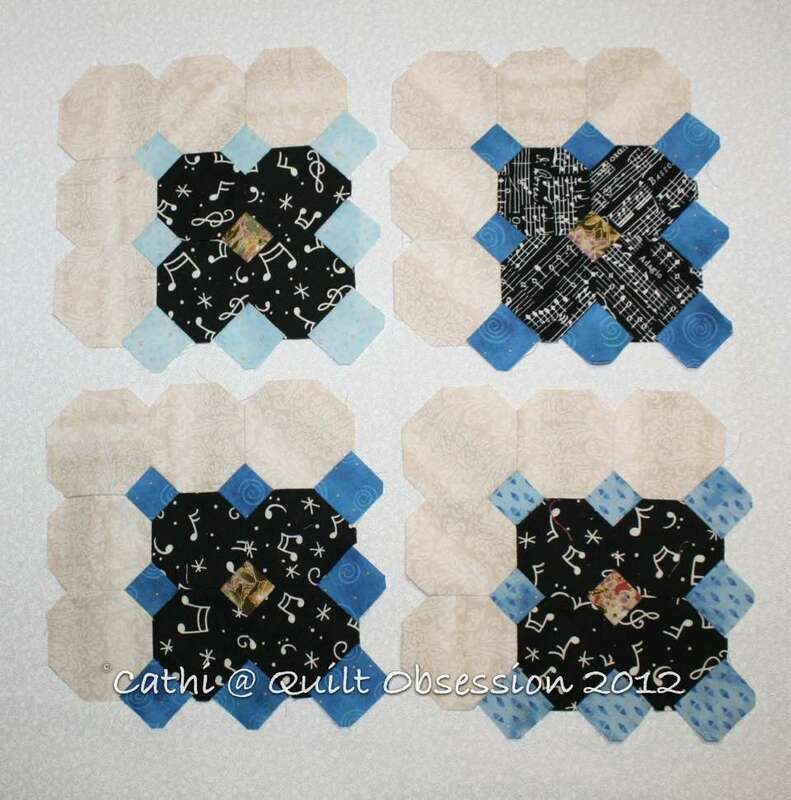 Lovely blocks…I don’t think you create anything that isn’t grand! I’m with Baxter, an afternoon snooze sounds perfect! Love the blocks, the little touches of colour are wonderful! And Baxter is as cute as ever! I had forgotten about those blocks. It’s good that you have so many different blocks to work on. 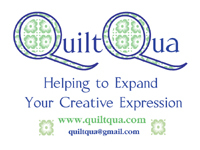 You can never get bored that way and a lot of quilts will be finished near the same time. Look at the size of Baxter’s tail! He really has some long fur there. I really think that is one that you need to finish asap, WOW! Just how long is that big boy now? I bet he could stretch out the width of your bed! I’ve run out of adjectives to describe your blocks! LOL Jasper drags his toy/s into our bed, too. I swear! I have to adopt a long-haired kitty again…seeing Baxter’s grey fluffy tail makes me miss my Maxie. Very pretty green batik, love the colours you use. Baxter looks so cute. Butter wouldn’t melt in his mouth!